The pound-for-pound best fighter in the world returns on Friday when unified lightweight champion Vasiliy Lomachenko defends his titles in Los Angeles. Lomachenko, the two-time Olympic gold medalist from Ukraine, was expected to face IBF titleholder Richard Commey in a unification bout that was called off after Commey injured his right hand. 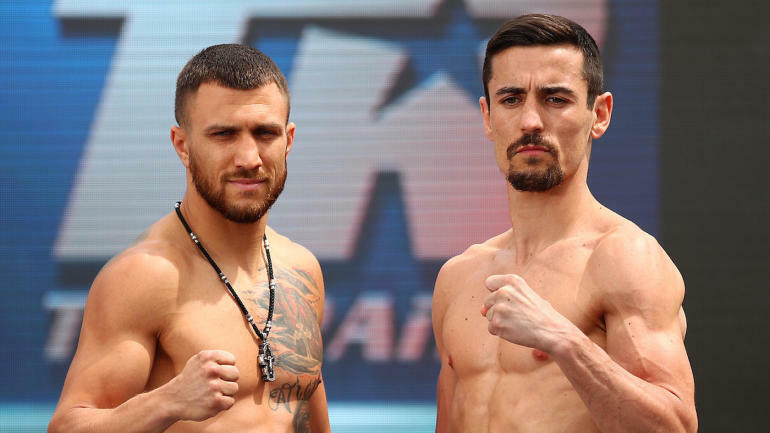 Instead, Lomachenko faces mandatory challenger and former WBA titleholder Anthony Crolla of Great Britain in the main event from Staples Center. Want more Boxeo? Subscribe to my podcast State of Combat with Brian Campbell where we break down everything you need to know in the ring, and be sure to listen to our preview of Lomachenko vs. Crolla below. CBS Sports will be with you throughout the night with continuing coverage of the fight in Los Angeles with our live blog below. If you are having trouble viewing the blog, please click here. CBS Sports will be with you for every punch from the bout in Los Angeles with our updating scorecard and live updates below. If you are having trouble viewing the results or want to refresh the scorecard, please click here.